mixedbag April 9, 2015 May 27, 2016 No Comments on Snack Time is Bear-y good! My daughter, M, loves food. She has never been one to fuss over meal times (at least, not yet!). I really lucked out with her! Though she happily eats whatever I make her, every once in a while, I like to jazz things up for her. So I made her teddy bear toast for her snack yesterday. 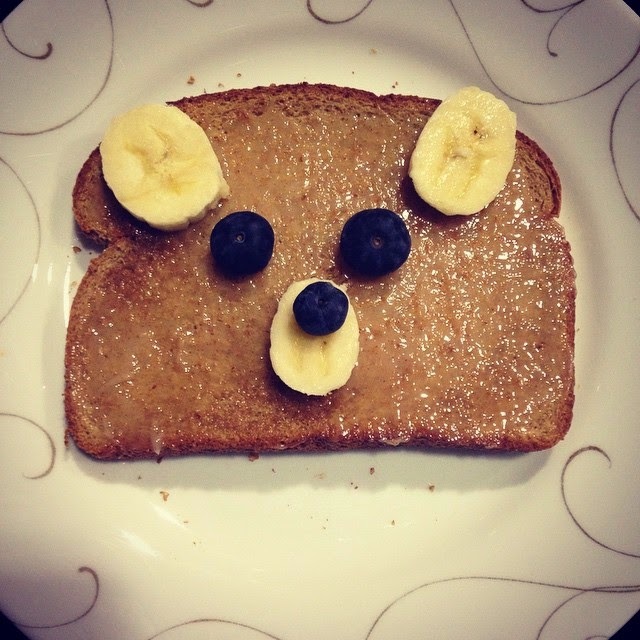 I made cinnamon-honey butter (recipe below) for the bear’s face and used blueberries for its eyes and nose. You could use black raisins too. Mix these three ingredients well. Slather on toast and enjoy! You could even shape the remaining butter into a log and refrigerate it. Use it on your pancakes, scones or croissants. Bear-y yummy!